Caps: The caps are usually white colored. Stems: The stems are long with petite. Size: They are long. At their base there is a collar which is the reason for their long growth style. Stem: They have thin delicate stems which can grow up to five inches in length. Taste: They are crunchy when bite and a refreshing flavor. 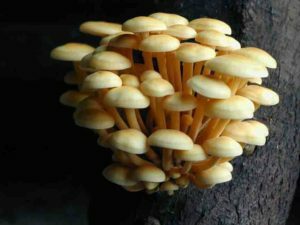 Wild: Wild enoki is slightly different from the produced form. The wild ones have shorter stems with larger caps and the color is orange to brown.